Gopi has successfully named this plant Guava on the facebook. "The guava has been cultivated and distributed by man, by birds, and sundry 4-footed animals for so long that its place of origin is uncertain, but it is believed to be an area extending from southern Mexico into or through Central America." 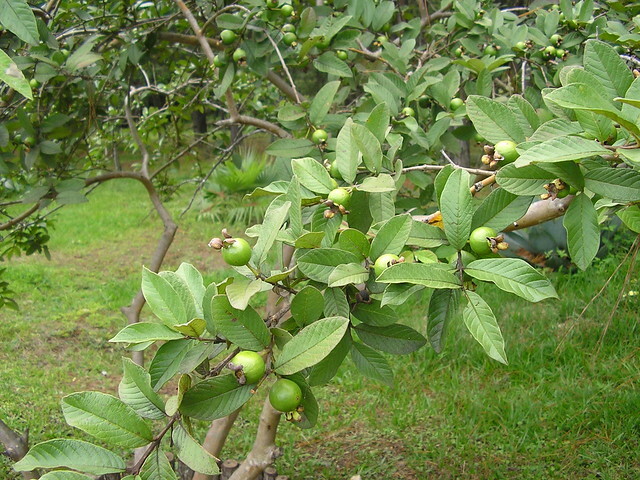 "In many parts of the world, the guava runs wild and forms extensive thickets–called "guayabales" in Spanish–and it overruns pastures, fields and roadsides so vigorously in Hawaii, Malaysia, New Caledonia, Fiji, the U.S. Virgin Islands, Puerto Rico, Cuba and southern Florida that it is classed as a noxious weed subject to eradication." Guava has countless uses as a food item, including: raw guavas eaten out-of-hand, seeded and served sliced as dessert or in salads, cooked, stewed guava shells (cascos de guayaba), canned, served with cream cheese, guava paste, guava cheese, guava jelly, guava juice, syrup for use on waffles, ice cream, puddings and in milkshakes, etc. "The roots, bark, leaves and immature fruits, because of their astringency, are commonly employed to halt gastroenteritis, diarrhea and dysentery, throughout the tropics. Crushed leaves are applied on wounds, ulcers and rheumatic places, and leaves are chewed to relieve toothache. The leaf decoction is taken as a remedy for coughs, throat and chest ailments, gargled to relieve oral ulcers and inflamed gums; and also taken as an emmenagogue and vermifuge, and treatment for leucorrhea. It has been effective in halting vomiting and diarrhea in cholera patients. It is also applied on skin diseases. A decoction of the new shoots is taken as a febrifuge. The leaf infusion is prescribed in India in cerebral ailments, nephritis and cachexia. An extract is given in epilepsy and chorea and a tincture is rubbed on the spine of children in convulsions. A combined decoction of leaves and bark is given to expel the placenta after childbirth." So there you go, guava.